Lucia: No it's not...I'm the one who says when it's over! American director James Ivory and Indian producer Ismail Merchant make up one of the longest-lasting film partnerships in the history of cinema, beginning in 1961 when Ivory traveled to India. Along with screenwriter Ruth Prawer Jhabvala, they are best know for their literary adaptations such as A Room With a View, Howard's End, and The Remains of the Day. But it wasn't always so. 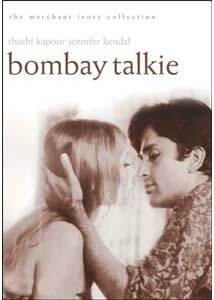 Their company, Merchant Ivory Productions, was originally formed with an eye towards making films in India for the export market, and Bombay Talkie is an example of these earlier, lesser-known films. It's the story of Lucia Lane (Jennifer Kendal), an English writer visiting Bombay. While taking a tour of a film studio, she meets writer Hari (Zia Mohyeddin), who is instantly smitten with her. But her eye is taken by handsome leading man Vikram (Shashi Kapoor, with whom Ivory had worked several times previously, and Kendal's real-life husband). Vikram returns her interest, which doesn't go down well with his wife, and Lucia repeatedly manipulates both men in a contest that can only have one winner. Although made for an English-speaking market, in many ways the film is similar to other Indian films from the same time period. The colorful costumes and settings are always visible on the screen, and certainly the love triangle plot would not be out of place. But in other ways, the film is quite different and offers an interesting contrast. Contrary to 99% of Indian films, there are no lavish song and dance numbers, which interrupt the realism of the films. Instead, they are either presented as part of the filmmaking process (a dance rehearsal on a giant typewriter), or as excerpts from the films being made. But it is character development that most separates Bombay Talkie from typical Indian films. Although the male protagonists are fairly simplistic (the sensitive poet and the vain movie star), and their personalities are established early in the movie, the character of Lucia is complex and interesting, and one gains a deeper understanding of her as the film progresses. She is vain and manipulative, indecisive and demanding, but at the same time she is also unhappy, lonely (her daughter rebuffs her when Lucia asks if she can visit her), and aware that the best part of her life is behind her. Indeed, on the occasion of her birthday, Lucia says that she used to look forward to birthdays, thinking that things could only get better, but now she wonders why she should celebrate growing old and ugly. Although the film is often visually interesting, with the careful compositions and beautiful exteriors that would characterize Merchant/Ivory's later films, it is ultimately in its examination of its characters, as well as the themes of loss, culture clash, and fate that the film retains one's interest. Image Transfer Review: The image is mostly very good, with bright, vibrant colors and more detail than one would expect, given the age of the film. There isn't much shadow detail, and darker scenes are sometimes grainy, but these are probably limitations of the source material. The one major defect in the image in the excessive edge enhancement, which is distracting throughout. Audio Transfer Review: The mono audio doesn't match up to the quality of the image. There is a constant low-level hiss, which rises in volume whenever the characters speak or there is other sound. It's also limited in fidelity, and the soundtrack music often sounds tinny. Extras Review: Conversation with the Filmmakers is an interesting interview with Ivory, Merchant, and screenwriter Ruth Prawer Jhabvala in which they discuss the making of the film, expectations of Indian audiences, spiritual guides, and the role of the writer in Indian films. Helen, Queen of the Nautch Girls is a fascinating documentary about Burmese/English dancer Helen, who had already appeared in over 500 films when this was filmed in 1973. The narration, written by Ivory, attempts to link some of the conditions of Indian filmmaking to both history and societal conditions, not always convincingly. There are interviews with Helen, played back on the soundtrack to footage of her applying her makeup, readying herself for a film, and riding in a car. But the bulk of the film is made up of extended clips of dance numbers from several of her movies, and they are a delight to watch. Although the full-frame image is plagued by speckles and horizontal scratches, especially in the clips, it's a must for anyone interested in Indian film. The three theatrical trailers are all anamorphic, with varying degrees of grain. This early Merchant/Ivory film is not only interesting in terms of its visual beauty, but also in its detailed character analysis of one of the main characters. For anyone interested in Indian film, it's also fascinating to compare and contrast this film, made for the export market, with the domestic product. Add in a good transfer, a great documentary, and this is a winning package.